This book continues the story of a North Carolina country boy, who tried to serve his country in war-time and wanted to play on The Grand Ole Opry. While in the Navy, he suffered a nervous breakdown after being gassed, but overcame adversity to realize his dream of playing steel guitar with six of the big-gest Opry stars. He married a Nashville native, who worked inside the industry, including radio, record labels, music publishing, side-by-side with notables like Porter Wagoner on Music Row, and authoring several music books.Theirs is a true story of the mu-sic scene, then and now, touching the lives of numer-ous country stars, their sidemen, and session play-ers, and sharing their lives and road stories while traveling every highway out of Nashville. Because I have been a "sideman" and a slightly well-known person, I find How-ard White's book to be very interesting. A lot of so-called stars have written their biographies, but I don't remember any significant books written by accompany-ing musicians. I think it will be welcomed by interested people, because of this different perspective. I met Howard when he first arrived in Nashville, around 1951. We have shared many laughs and good times, and he has more friends than anyone I know. I am proud to be among them. 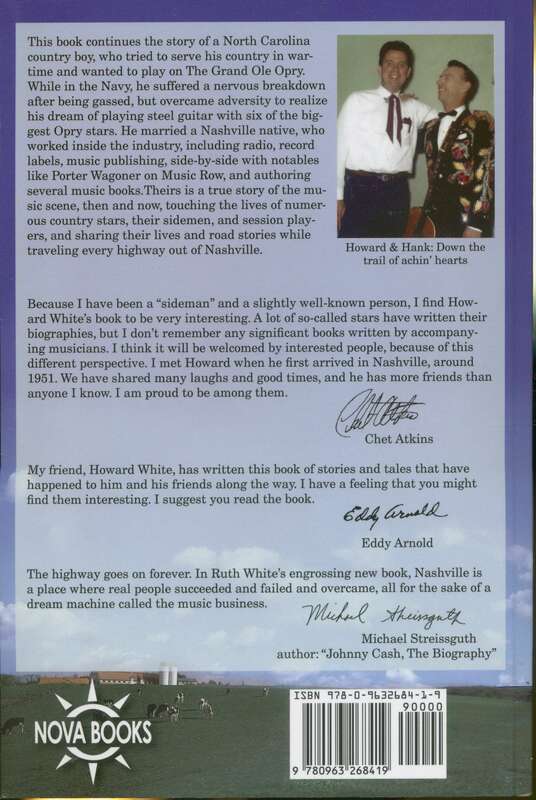 My friend, Howard White, has written this book of stories and tales that have happened to him and his friends along the way. I have a feeling that you might find them interesting. I suggest you read the book. Michael Streissguth author: "Johnny Cash, The Biography"
Howard's earliest musical influence did not come from his own family, but from his neighbors, the Jamisons, who would gather on their front porch in the evenings and play old songs on their stringed instruments. Howard taught himself how to play guitar from records and the radio; later, when he bought a Hawaiian steel guitar and amp from the Sears and Roebuck catalog, he wrote his idol Jerry Byrd in Cincinnati and who wrote back, offer-ing valuable advice on tuning and string arrangements. While in high school, Howard formed a band that played at square dances and other local social events. When Howard White joined the navy in 1944, he was assigned to special ser-vices at a naval air base in Washington, D.C. in the chemical warfare branch where, he wrote, "my job for my country was not to fight, but to test uniforms, with me in them, against gas... They put me, and others, in spe-cial gas chambers and turned on the gas to see if the suits leaked. Some of the guys were burned. I developed a nervous condition which grew worse and worse." He was to spend his life in and out of hospitals, improperly diag-nosed for nearly 40 years and, to this day, insufficiently acknowledged and/or compensated by the U.S government. Howard played steel for Don Gibson on WNOX (Knoxville) Radio's Mid Day Merry-Go-Round for about a year in '51-'52, then moved to Nashville to work with 'Waltz King' Cowboy Copas on the Grand Ole Opry. He toured briefly with Minnie Pearl and Hank Williams Sr., then returned to work with Copas until Copas dis-banded his group in '53. A pattern was established of working a succession of jobs with different artists: Ferlin Husky, Audrey Williams, Jim Reeves, Judy Lynn, Hawkshaw Hawkins and Jean Shepard, Wilma Lee and Stoney Cooper, Red Sovine, Mel Tillis, Grandpa Jones, the Duke of Paducah and lastly, in his longest stretch with any single artist (`60-'64), Hank Snow. As Howard explained, "..An act would only add about two new songs a year to (his) program and it got boring to a hyper person like myself." He believes now that if he had understood more about his manic-depressive disorder, "maybe I could have stood songs like 'I' m Movin' On' one more time. But as it was, I just kept movin' on to greener pastures. I knew every highway out of Nashville by heart." In the mid-'60s, having come to despise life on the road, Howard retired from playing and has spent much of his time since then going from pillar to post" in the various roles of songplugger, promoter, and music publisher. Like many of the musicians of his generation, he has come to know everyone in - and all aspects of - the music business. 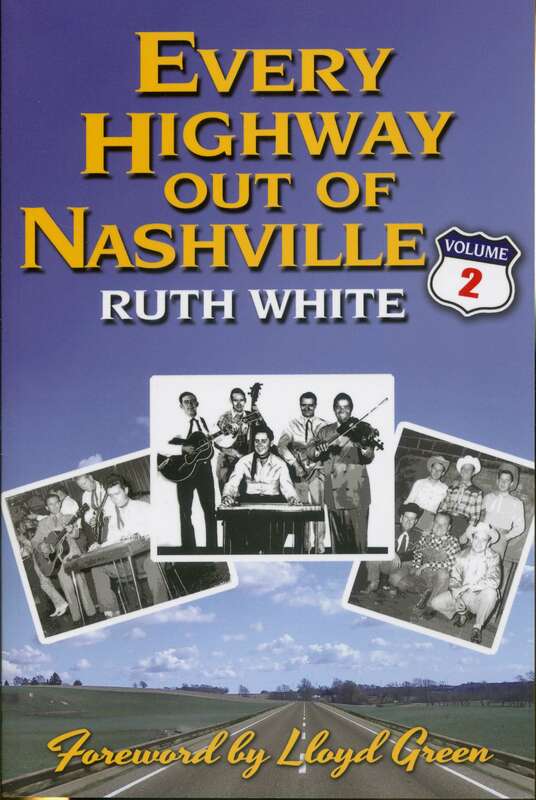 "Us old sidemen who used to work the Opry spots and the one-nighters," he writes, "are mostly not playing now. We're scattered to all walks of life... (But) I've met a lot of people I' m proud to know, too many to name. There are a few who love me." Customer evaluation for "Every Highway Out of Nashville, Volume 2"